Sophomore slumps are common, but their regularity doesn’t make them any more palatable to witness. After making one of this decade’s best films with the thrilling and misanthropic Nightcrawler, Dan Gilroy has created another ode to his hometown of Los Angeles and the complex makeup of its citizens in Roman J. Israel, Esq., a legal activism drama starring Denzel Washington as an activist lawyer who never seemed to escape the culture (and clothing) of the 1970s. Unfortunately, where Nightcrawler was a brilliant character study that laid bare the psychopathy underpinning the American can-do spirit, Roman J. Israel, Esq. is a character drama overburdened by the pretense of its central character and its lack of believable conflict. It’s a film that believes that costume is character, that talk is action, and that there’s no better villain than a hero’s worst impulses, even if you have to manufacture those impulses to get some conflict. I knew we were in trouble from the get-go, a scene which has Roman narrate a legal brief indicting himself for betraying everything he stood for. 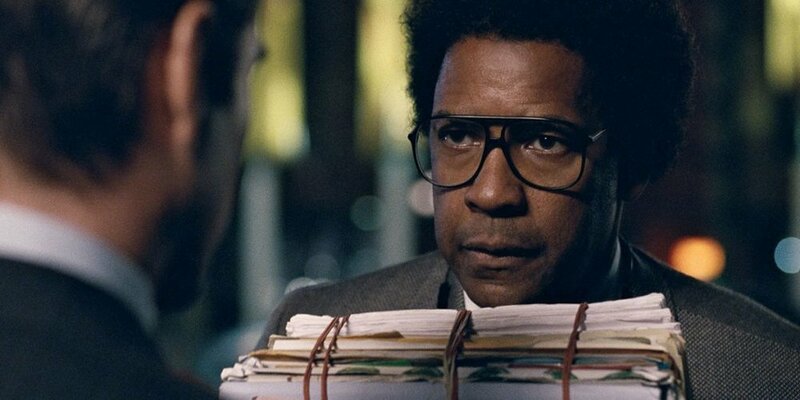 This in media res opening sets us up for the plot trajectory of the film, which leads Roman (who dresses like if Questlove starred in a Civil Rights epic, complete with mottled afro, out-of-date suit, and enormous plastic-framed glasses that look more like goggles) from his pro-bono criminal defense firm where he hits the books while his partner does the litigating to the massive firm run by Colin Farrell’s sleek lawyer who favours fees over justice. Created by the same core team as Nightcrawler (written and directed by Gilroy, shot by Robert Elswit, and edited by John Gilroy), Roman J. Israel, Esq. can at least boast of technical efficiency. There is evocative photography here. As in Nightcrawler, Gilroy demonstrates a knack for shooting Los Angeles, relishing in the ways the city’s streets capture light, from the harsh sunlight of daytime to the endless street lights at night. The crisp editing keeps scenes moving at a good pace and does a lot to disguise from the general misshapen structure of the narrative. But it soon becomes obvious that Roman is insurmountably fantastical. As he’s presented in his outlandish clothing, Autism-spectrum-style speech patterns, and impassioned dedication to the outdated ideals and routines of the 1970s, Roman is hard to take seriously. He’s a character that likely reads well on the page, but seems overly-calculated when presented in the flesh. However, no matter how affected Roman’s persona is, the film’s biggest misstep is its refusal to follow through with the outlandish character it creates. Gilroy writes himself into a corner by presenting Roman as unwaveringly ethical only to have him inexplicably abandon those ethics midway through in order to drive the plot and foreground the tension between idealism and realism. In the end, the film’s narrative engine is driven by contrivance and not authentic character, which sinks the entire ethical quandary it presents. I can imagine a stronger version of this story, one that jettisons a late-film thriller element, remodels Carmen Ejogo’s saintly non-profit activist into a character of genuine action (it’s not good that a film so focused on activism only talks about it, but never demonstrates what activism looks like on the ground), and focuses on the realistic textures of a man like Roman instead of his ostentatious costuming. There’s an interesting story buried here about an icon of the past adjusting to the reality of the present, and a studied Denzel Washington performance supporting that story, but the resulting film is more muddled than complex. Roman J. Israel, Esq. is a profound disappointment, made all the more dispiriting due to the talent involved in making it. Written and directed by Dan Gilroy; starring Denzel Washington, Colin Farrell, Carmen Ejogo.